You are currently browsing the Fat Cyclist weblog archives for April, 2008. A few weeks ago, I went to ride the Corner Canyon trails in Draper, UT. It was kind of a last minute thing, so I didn’t call anyone; I just went. I climbed on my mountain bike, rode for about 90 minutes, and then rolled back into the parking lot, planning to go home for the day. And that’s when I saw Dug, suiting up in the parking lot for a ride of his own. Dug’s mountain bike frame had recently cracked, so he was planning to ride on the road — up the North side of Suncrest and back down. About a 45-minute ride. I made the switch, after which followed the most peculiar cycling sensation I have ever had. The handlebars felt so narrow. The front wheel seemed so close. The tires seemed ridiculous. 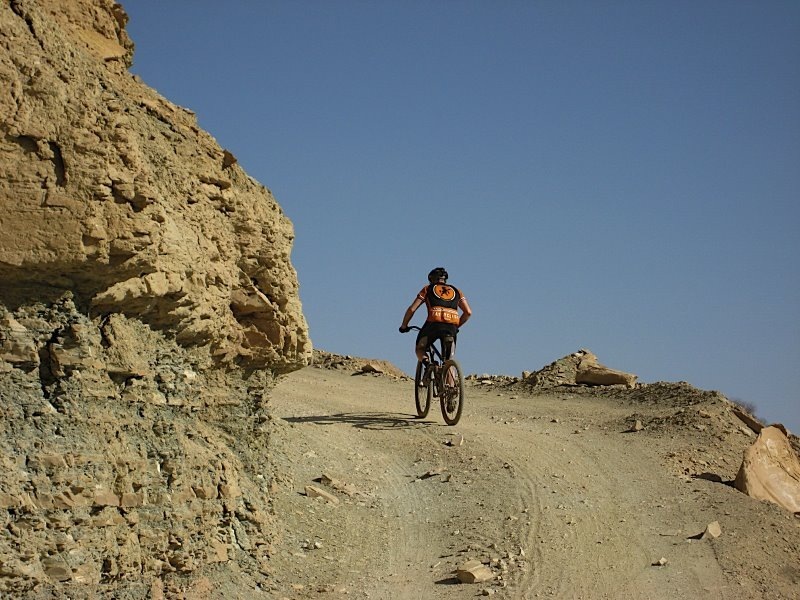 And that’s when it occurred to me: mountain biking and road biking should be part of a triathlon, but one with three great events, instead of the way most triathlons are: one good event, and two really awful ones. It wouldn’t be until later that I would figure out what the third event would be. More on that in a moment. I am pleased to announce that I will be putting on my very first event this Summer: The Fat Cyclist Triathalon (please note this is a triathalon, not a triathlon). I am pretty darned certain you’re going to want to mark this on your calendar. Here’s how it’s going to play out. 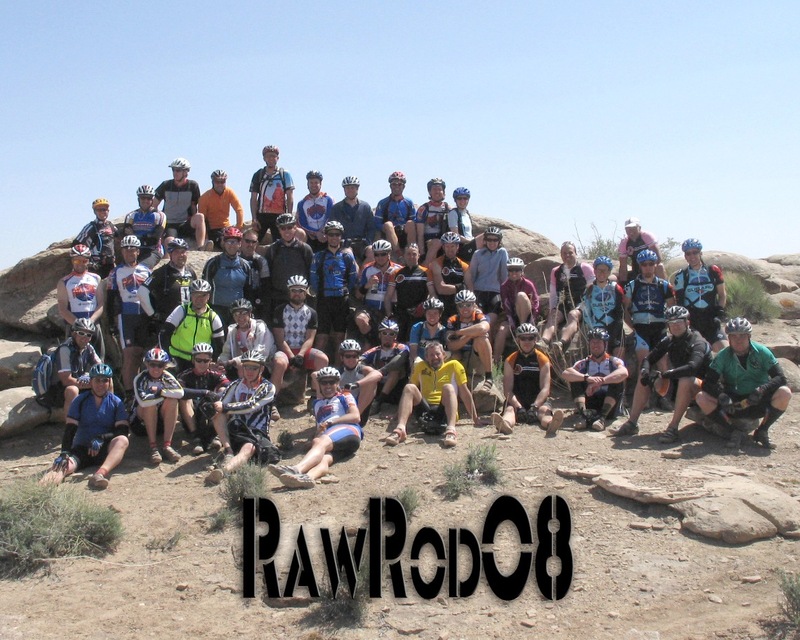 Mountain Bike Leg: We’ll begin from my house in Alpine, UT, where we’ll ride mountain bikes up Hog’s Hollow, then down to Sliding Rock — a natural waterslide in the Hog’s Hollow area. The winner of this first leg of the race will be the person who goes down the Sliding Rock with the most panache, as judged by a distinguished panel of three. Road Bike Leg: After Sliding Rock, we’ll ride back to my house, where we’ll quickly transition over to road bikes. Everyone will be required to remark on how strange road bikes feel after being on a mountain bike. We will then ride to Tibble Fork Reservoir and back. The winner of this leg of the event will be the person who can, on the spot, come up with the most clever limerick about a topic which will be provided at the beginning of this leg of the race. Beer-Boiled-and-Grilled-Brats at Fatty’s: Back at my house, the third leg of the race will consist of us all eating exquisitely delicious brats. I will ask Kenny to make bread for the brats, which will make them even more wonderful, if that’s even possible. I will also make Seven-Layer Dip for the occasion. My Seven-Layer Dip is really, really good. On New Year’s Eve last year, Brad declared his intention to eat nothing but this dip. And Brad knows food. Anyway, the winner of this leg of the event will be determined by whoever seems to enjoy the brats most (which is not the same thing as whoever eats the most brats). Oh, and by the way, if you’re strictly a roadie or MTB-er, it’s OK to miss a leg of the race for the kind of riding you don’t have a bike for. It is not OK to miss the third leg of the race. That leg is mandatory. Prizes will be awarded to the winner of each leg of the event, as well as for other categories which I will make up on the spot. I’m not sure what the prizes will be, but I bet you anything I can get someone else to pay for them, and I further bet that they’ll be better than most prizes at most local races. Ooooh, you know what would be cool? If there were an event T-shirt. I wonder if I could badger the Twin Six guys into designing a Fat Cyclist Triathalon T-shirt? Only one way to find out, I suppose. The Inaugural Fat Cyclist Triathalon will be June 21, the first Saturday of Summer. I haven’t settled on the time yet. When works for you? Because that’s the first weekend after my birthday (June 18, in case you’re curious). So this isn’t just a triathalon, it’s my birthday party, too. And you’re invited. Is There Anything Special About This Particular Birthday? There sure is. Two special things, in fact. (Those of you who never read the Hitchhiker’s Guide to the Galaxy books should just skip this paragraph.) First, I’ll be turning 42, which means I should, sometime during the course of the day, arrive at the question to life, the universe, and everything. I’ll be happy to share that with you. Second, my birthday actually marks me as demonspawn. Specifically, I was born in the 6th month of 1966: 6/66. Get it? Also, I was born on the 18th day, which splits nicely into 6+6+6. So there’s a good chance horns will erupt from my head and I’ll eat a live goat. It’s worth coming by to find out, anyway. 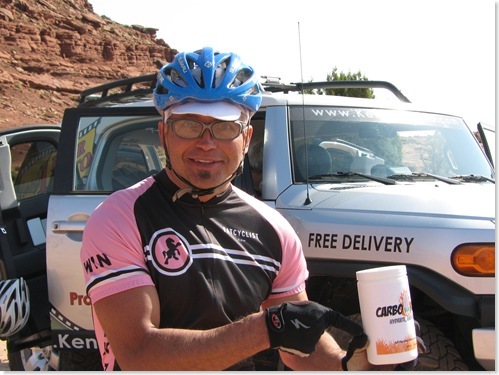 To register for the Fat Cyclist Triathalon, I’m going to ask you to make a donation to the Lance Armstrong Foundation via MikeRoadie’s LiveStrong Challenge Page. I won’t tell you how much, though anywhere from $25.00 – $50.00 seems like a good amount. And let me know in the comments section that you’re likely to come, so I can start to get a sense of whether this will be me and a few guys, or a big ol’ extravaganza. I’m kind of hoping for the extravaganza, to tell the truth. The fact is, I just made this whole thing up right now, but I’m dead serious about doing it (and I called Susan to make sure she’s cool with it — she is). I know a lot of you are too far away to come participate in the Fat Cyclist Triathalon, but for those of you who can come, it’ll be fun to meet, ride and eat. Last Saturday, I did something I have never done before. 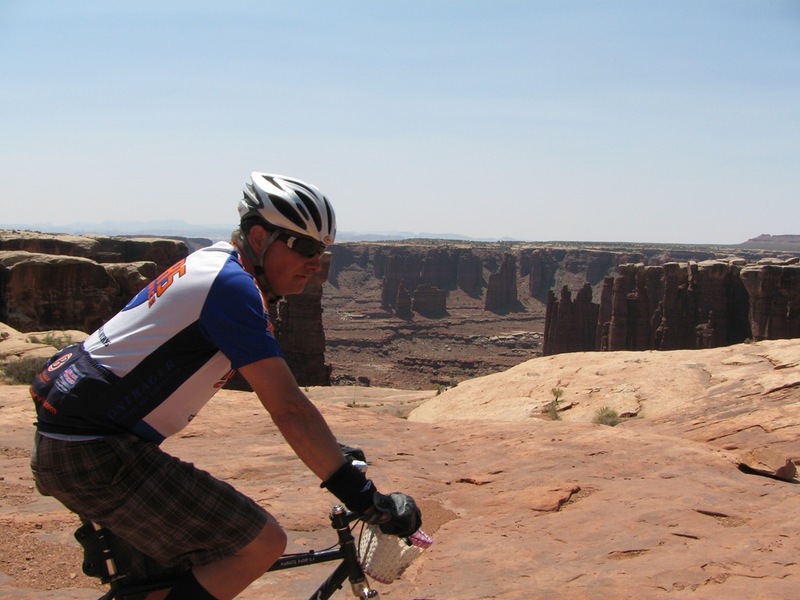 For the first time since I have begun riding about fifteen years ago, I embarked on 100-mile mountain bike ride with no objective other than to enjoy myself. I would not worry about who was behind me and catching up. I would not care how long I was out on the ride. I would not worry about whether I was eating the right food, or what my heartrate was. I would not, in short, treat this ride as if it were a race. And the day was spectacular. Boil a copious quantity of brats in a beer-and-onion stew for 25 minutes. Grill over an open flame. Serve on Kenny’s homemade bread with mustard. That’s it. That’s the whole thing. I took charge of boiling the brats, Kenny handled the grilling and the bread. Lo and behold, we were both recognized as marvelous people by one and all. Everyone stood around the campfire right at the top of Horsethief — the beginning and endpoint of the ride we’d be doing tomorrow, as well as the campsite for the night — and ate their fill (ranging from 1 to 4 brats per person — I had 2), then just chatted. Slowly but surely, I’m being won over by this camping thing. By about 10:30, the group broke up and I headed off to the tent, where I had set up a cot. For extra insulation, I had brought a second sleeping bag. I didn’t really need it, though; it was strictly a 1-bag night. BotchedExperiment — who was sleeping outside the tent in this homemade all-in-one canvas/mattress/sleeping bag contraption he has created — loaned me a pair of earplugs. These proved to be invaluable, since everybody in the tent (including me, from what I’m told) snored a bit. Even without taking Ambien (or anything else), I slept fine. The next morning, Dr. BotchedExperiment admitted he had had a miserable night. When he had packed, he had neglected to include an important component in his all-in-one sleeping contraption: the sleeping bag part. I can scarcely describe my pleasure in telling Botched that I had brought an extra sleeping bag he could have used, had he only asked. Around 6:30 or 7:00 in the morning (I wasn’t wearing a watch), we started rolling. Normally, I would have made sure I was one of the first ones going, and would have made a point of staying with the lead pack. This time, I left toward the back of the group, and before long was even further in the back. This would be an emerging pattern, and one that I became increasingly comfortable with. 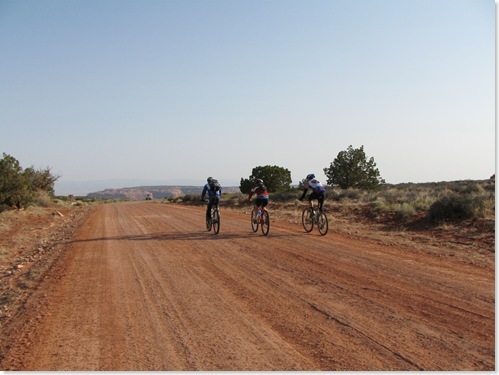 The place we started from (top of Horsethief) and direction we rode the White Rim Loop — clockwise — meant that the first thirteen miles are on a gently rolling climb. This was a brilliant idea: instead of a hair-raising descent or brutal climb, how about beginning the day with a nice warmup on a wide dirt road? Here’s Brad (sporting the sleeveless jersey plus armwarmers look), Dug, and others tooling on up the road. 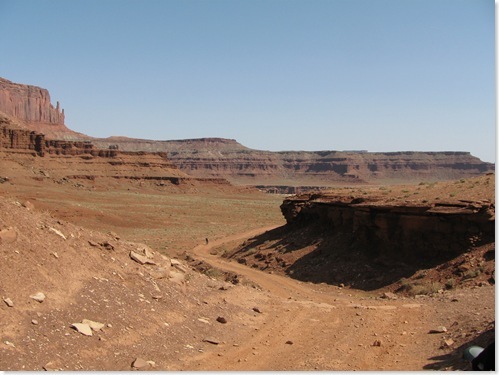 After a relaxed cruise up the dirt road and a few miles of pavement, we were at the top of Schafer, a switchbacked, rutted out, dusty, rocky 2000-foot descent down the face of a cliff. This was, essentially, the only time during the day I did not enjoy myself. My left wrist hurt during the descent, threatening to buckle, which could have mean a catastrophic (i.e., fatal) fall. I was nervous and, frankly, resentful. The good news, though, was that I wouldn’t have to climb it. Which is good, because Schafer was in bad enough shape that there’s no way I could have climbed that road on my Superfly, much less the single speed. As the worst, most nervous, twitchiest descender in the world, I had dropped way behind my friends by the time I got to the bottom of Schafer. To their credit, they rode a nice, pokey pace until I caught up, and then we were at the first re-grouping of the day, about 25 miles into the ride: Musselman’s Arch. And this is where I noticed, for the first time, that Brad’s CarboRocket energy drink deserves to be a huge success. Brad had brought along a couple of big coolers filled with CarboRocket, and that’s what everyone was lining up to fill their bottles with. I drank it all day, and never got sick of it. Others were saying the same thing. It is seriously the best energy drink I have ever tried. Uh, Brad? You’ve got something stuck in your teeth. Shortly after I arrived at the first regrouping spot, I saw a bunch of people take off, in a hurry to set a personal best, or to race someone to the finish line. I recognized that usually I would have been one of those people. This time, though, I was just riding a comfortable pace and taking in the view. And I was loving White Rim like I’ve never loved it before. I didn’t worry much about whether I was going fast or slow enough to stay with a group, and as a result I sometimes rode with a good-sized group of people, sometimes nobody at all. And I had plenty of time to take in the sheer enormity of White Rim. And you know what? It is huge. Mind-bogglingly big, really. It’s enough to make you feel tiny. Here’s Botched, for example, way off in the distance, all by his lonesome. Someone should tell him his bike would go faster if he pedaled it. Let me take a break from my own narrative to point out that just a few minutes after leaving Musselman’s Arch, Dug’s brother-in-law, Sleepy, crossed a major milestone: thirty miles into the ride marked — both in time and distance — the longest he had ever been on a bike. And he was doing the whole thing on my old Gary Fisher Rig, a fully-rigid single speed. In other words, Sleepy did his first 100-mile ride, his first 2+hour ride, his first mountain bike epic, and his first rigid singlespeed endurance ride, all at the same time. Dug does a good job of telling the story over at his blog (yeah, Dug has a blog now. We all knew he’d get one eventually). Here’s Sleepy, contemplating the grandeur of the White Rim. It’s also possible that he’s just wondering about whether he could end his life painlessly by riding over the edge. The sad thing about this picture of Dug is that you can’t really see the knee-high black socks he’s wearing. Which is too bad, cuz they go great with the pink-and-white basket and the plaid shorts. Around lunchtime, I noticed something very peculiar. Specifically, I noticed that I felt fine. I wasn’t exhausted, I wasn’t twitchy, I wasn’t half out of my head with race-induced dementia. I was, in short, enjoying myself. Also, I noticed that the temperature was bizarre. It was no warmer than 70 degrees. 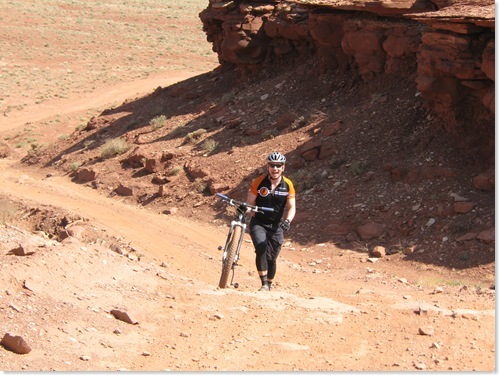 I had a hard time resolving the incredibly comfortable riding conditions to the parched-desert look of White Rim. To have a clear, sunny day, mild breezes (with occasional gusty headwinds), and the exact temperature I set my thermostat to at home just seemed out of character. 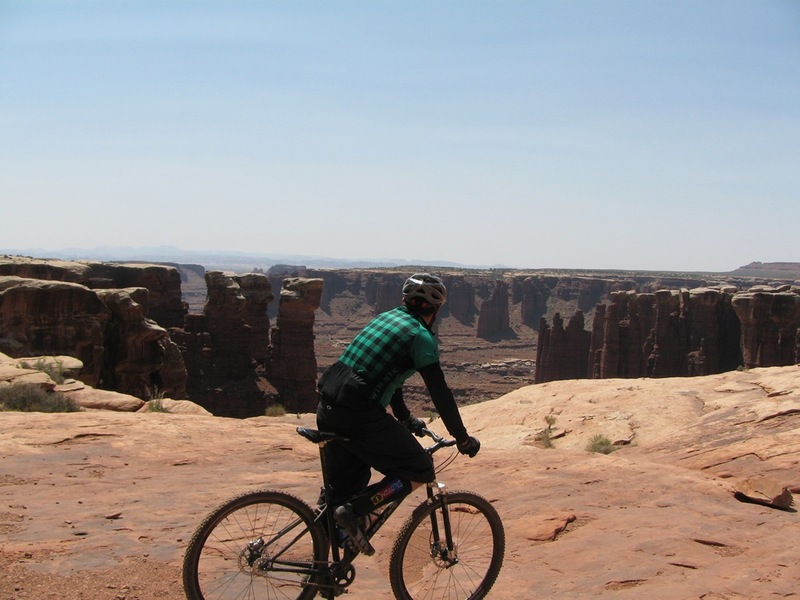 There’s a weird thing about riding the White Rim: it’s like two different rides. 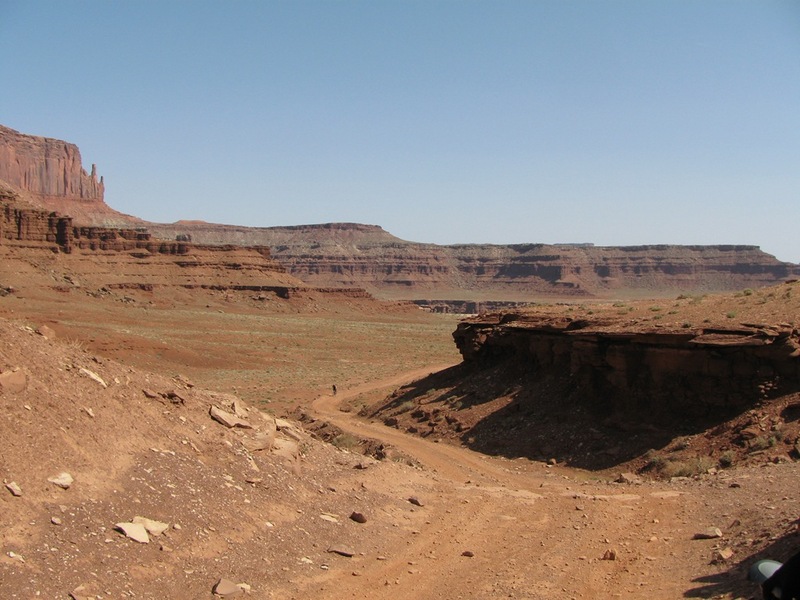 From Shafer to Murphy’s Hogback, it’s all wide open desert riding, with cliffs off in the distance. Then you cross over and from the Hogback to Horsethief, and you’re right in the middle of the cliffs and canyons, with the river right beside you. Oh, and there’s a lot of sand, too. Which, by the way, never forced me off my bike. 29" wheels = good. As I rowed my way through the sand, now 75-80 miles into the ride, I could really feel my left wrist starting to ache. Not bad enough to whine about it, but I whined anyway. But I was still having a terrific time. At one cliff, about five guys got a big sandstone boulder and rolled it off the edge. It fell for about a five-count, and then exploded into dust, while many of us looked on, laying on our bellies and peering over the edge at the drop below. I was a fool and didn’t get a picture of this, but KanyonKris did, and it really gives you an idea of how far down that boulder had to fall. KanyonKris, Adam Lisonbee, and I climbed Hardscrabble together. I pushed a lot, and so did Adam. However, Adam had a better excuse than I did: this was the second day in a row he had done this 100-mile epic. Kris, meanwhile, was on a mission to climb the whole thing. I encouraged him as best as I could by singing "Eye of the Tiger." This was highly effective, mainly because it made him want to get away from me. I wondered aloud to myself, "On a 100-mile ride, from mile 90 on all I can think about is the finish line. If this were only a 90 mile ride, I would have spent miles 80-90 thinking about the end. Why can’t I just enjoy the whole ride for what it is?" To me, this seemed like a very sage question, and worthy of sharing. Mostly, people shook their heads and said "whatever." Pfff. At the top of Hardscrabble Hill, Dug gave me half of his ice-cold Diet Coke with Lime, making him the best friend that has ever lived. For some reason, I wanted to show that I could clean it. On my singlespeed. Plus, Kenny and Brad were yelling encouragement from the top. Which helps. A lot. After finishing this ride, I felt something unique and new: I felt fine. I have never finished an epic without needing to sit and sip water and basically baby myself. But this time, not having killed myself during the ride, I felt tired — worked over, even — but not demolished. We loaded up — Dug, Sleepy, BotchedExperiment, and me in my BikeMobile — and headed home, planning to gorge ourselves at Ray’s Tavern in Green River. A perfect end to what I would consider a perfect day. But we had to stop for a moment to let BotchedExperiment throw up. And then we had to stop for a moment for BotchedExperiment to throw up. Again. But that’s his story to tell. And I hope he will. Let me tell you about my hometown: Alpine, Utah. It has one gas station. It does not have a grocery store. For restaurants, you have your choice between Dmitri’s Pizza and a Hogi Yogi (a sandwich chain). And that’s pretty much it, commerce-wise. Oh, except for one strange anomaly: there are two dedicated candy stores. One of them is Choclatier Blue, a high-end, handmade candy store where each chocolate is a work of art (and is priced like a work of art). I go there on Christmas, Valentine’s Day, Susan’s Birthday, and our Anniversary. The other place is called the Peppermint Place, and they mostly just sell stuff brought in from other candy manufacturers. Kind of a cutesy downscale Mrs. Sees. But I recently discovered my brand new favorite candy at the Peppermint Place: Candy-Coated Sunflower Seeds. The idea is simple: They’re just like Peanut M&Ms, but with sunflower seeds instead of peanuts. And they are so delicious. The brilliance is obvious, when you think about it. Just think about what you like about M&Ms, and you’ll realize Sunflower M&Ms are even better. 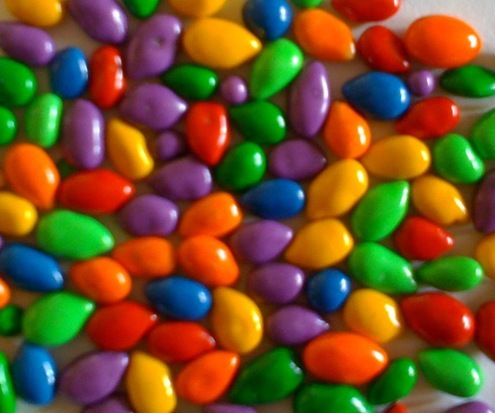 It’s not the chocolate that makes M&Ms so great; the chocolate is pretty pedestrian. It’s the candy shell crunch around the chocolate. And since sunflower seeds are tiny, you get more of that candy crunch with a handful. Peanut M&Ms are too big. I like the way they taste, but they’re the wrong size. A handful is just five or six. A handful of Sunflower M&Ms is like a thousand. The peanuts in Peanut M&Ms are too powerful. Mostly what you taste and feel are peanuts. Sunflower seeds are relatively soft, mellow-tasting and don’t overwhelm the chocolate and candy coating. In one hour, I head out to Moab. I’m going to buy a five pound bag of these things for the ride. PS: Turns out they’re available online. Click here or just Google chocolate sunflower seeds. In two days (that’s 48 hours for those of you who use the metric system), I’ll be riding in Kenny’s 2008 RAWROD — Ride Around White Rim in One Day. This will be the first time I’ve tried doing the ride on a single speed. And it’s the first time I will attempt a 100-mile mountain bike ride as my first century of the year. I predict the wind will be a problem. The weather forecast has Saturday as mild, slightly overcast, and a high in the low 70s (not metric). That’s excellent, but the forecast also predicts 15mph wind. Luckily, this wind will be at our backs at the beginning of the day. Unluckily, it will be in our faces the second half of the day…as we ride through the sandiest part of the ride. I’m sure, however, that the wind won’t blow sand into our faces. 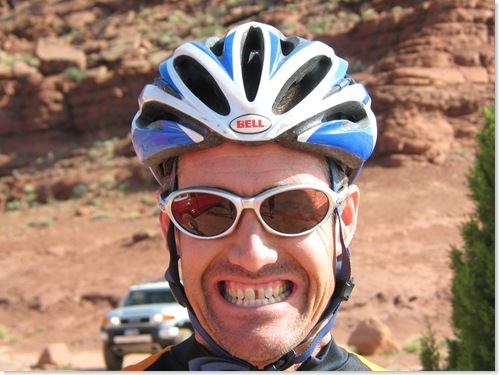 I predict that I will be kind of jumpy, giddy, chatty and goofy for the first 25 miles. It never fails. 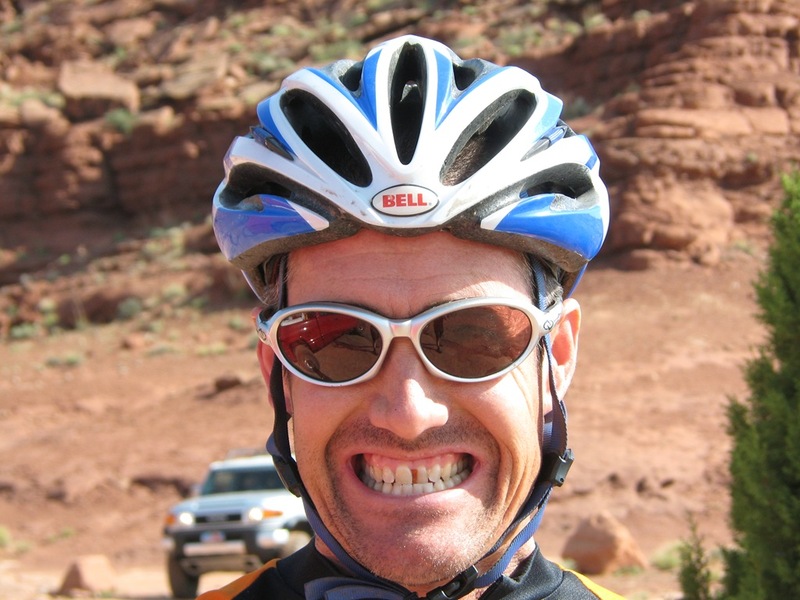 I get a massive adrenaline surge at the beginning of long rides and I get this big grin and am just so darned enthusiastic that people who haven’t had their morning caffeine tend to find me irritating. I predict I will take it out too hot. I always know I shouldn’t go out at top speed, but then I can’t help myself and I just fly, entirely convinced that my legs are going to feel this good the whole day. Oddly, they never do. I predict that I will be entirely non-jumpy, non-giddy, non-chatty, but still goofy (but in a different way) for the final 25 miles. Once the initial rush has worn off, I settle down and am actually a pretty good riding companion for 50 miles or so. I’m talkative, but don’t demand (nor require) conversation. I’m just happy to be there, and feeling good about the ride. Then, for the final 25 miles, I become a sullen, hateful being, full of spite and bile. Do not talk to me, because I will not have pleasant things to say. I have said 99% of the swear words I have ever uttered during the final 25 miles of big rides. I predict that I will ride alone for at least part of the day. This weekend, Dug, Brad, Kenny and I have vowed to ride the whole RAWROD together. I love to think that this will actually be the case, but I have a hard time imagining it. At some point I’m going to bonk and will actually get angry if people try to stay with me at my bonked-out pace. And I’m not the only guy who prefers to suffer alone. At various moments, others in the group are going to suffer, and will want to suffer alone. I’ve learned that when someone wants to suffer alone, it’s best to let them. Because that way if they die, you get their stuff. I predict that I will wish I had brought an iPod. I understand that many women are able to talk continuously for ten hours. I don’t know any guys who can (not saying they’re not out there, just that I haven’t met them…and also, that I don’t want to meet them). At that point, I”m going to wish I had brought an iPod. I predict that I will be angry at my past-self for having such poor self-discipline. During the big climbs, as I have to push my bike up the hill, I am going to mentally — and possibly literally — flog myself for not having dieted properly before this ride. “If you would have exercised some self-control,” I will say, accusingly, to my past-self, “You would be riding your bike up this pitch, instead of hiking it.” Sadly, my past-self was too busy eating carne asada burritos to hear what his future-self was saying. Too bad, because my future-self has a good point. I predict I will resent people who pass me. Even though this is not a race, I still tend to take it personally when someone passes me. I especially hate it when they say something friendly as they go by. On the other hand, I hate it just as much when they don’t say anything at all. My recommendation to my fellow riders? Don’t pass me. Wait your turn, and we’ll all get around the Rim together. Oh, and don’t crowd me, either. Stay 20 feet back at all times. I predict I will resent people who are pulling me but going too fast. Especially during the headwindish part of the ride, I intend to tuck in behind people, and never take a turn pulling. I’m not sure right now how I’ll rationalize that as an OK thing to do, but I figure I’ll come up with something. When these people start pulling away, I presume I will come up with a sarcastic remark, which I would utter…if only I had the wind. I predict I will take a lot of pictures at the beginning of the ride. At the beginning of the ride, everything looks like a photo-op. I predict I will take no photos whatsoever during the final 25 miles of the ride. 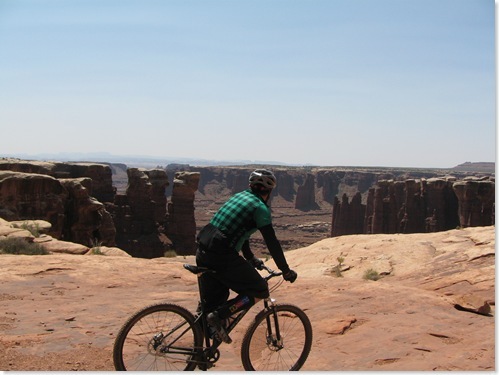 By the end of the ride, everything looks like just another cliff, just another bike, just another sandstone arch. Whatever. Let’s just get this over with, OK? I predict I will get sunburned. I’m pretty good about getting sunscreen on me. But I always miss a spot. Usually the tip of one of my ears. That will look awesome. I predict I will vow to never do this kind of ride ever again. I am willing to go out on a limb for this prediction. 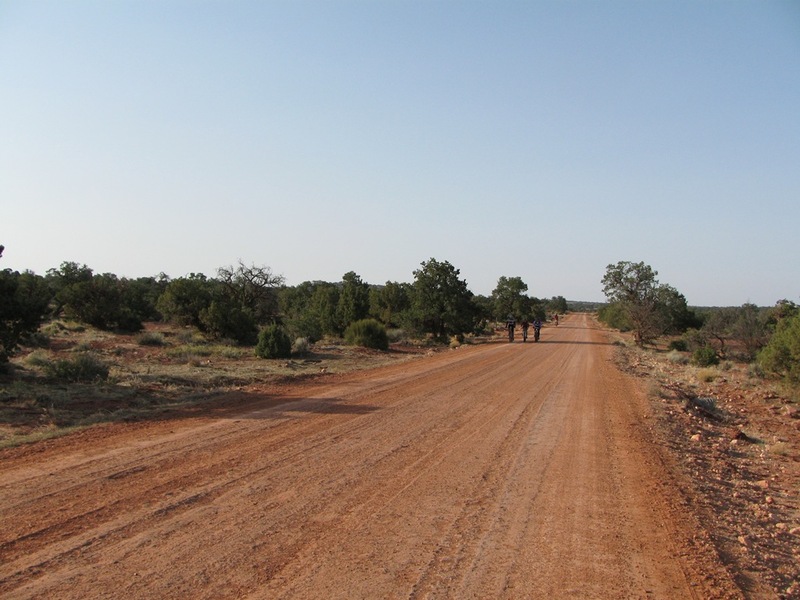 As I climb Horsethief road, the giant switchbacking climb that never ends right at the final five miles of the ride, it will become astonishingly clear what a stupid idea bicycles in general are, and what an even stupider idea this ride in particular was. This certainty will come with the clarity of an epiphany that cannot be denied. Which makes me wonder how I manage to come out and do the ride again every year. I predict that even when things get really bad, a small part of me will be happy, because good stories need conflict. Even as I’m bonked out of my brain, I’ll be composing the paragraph that makes it sound like I’m suffering nobly, somehow. However, if it’s someone else who bonks, it will be the occasion for great comedy. I predict I will be grateful it’s over. It’s amazing how quickly the pain subsides when you finish a ride. There have been times when I actually have started giggling with relief as I realize I have finished. I know, middle-aged men shouldn’t giggle. I’m not saying I’m proud of the giggling, just that it happens. I predict that by the time 3 days (72 hours, for those of you who use the metric system) has elapsed, I will be excited about going again next year. Which just goes to prove that I’m stupid. There’s a terrific singletrack network — Corner Canyon, in Draper, Utah — that is almost ridiculously convenient in its location. It is literally on my way home from work, so I can drive partway home, ride for an ninety minutes or so, and then finish my ride home. Importantly, this trail network doesn’t have a lot of trees shading it, so while a lot of the good local trails in this area are still covered with snow and mud, Corner Canyon — the lower part anyway — is in terrific condition. I’m going there twice, sometimes three times a week right now. 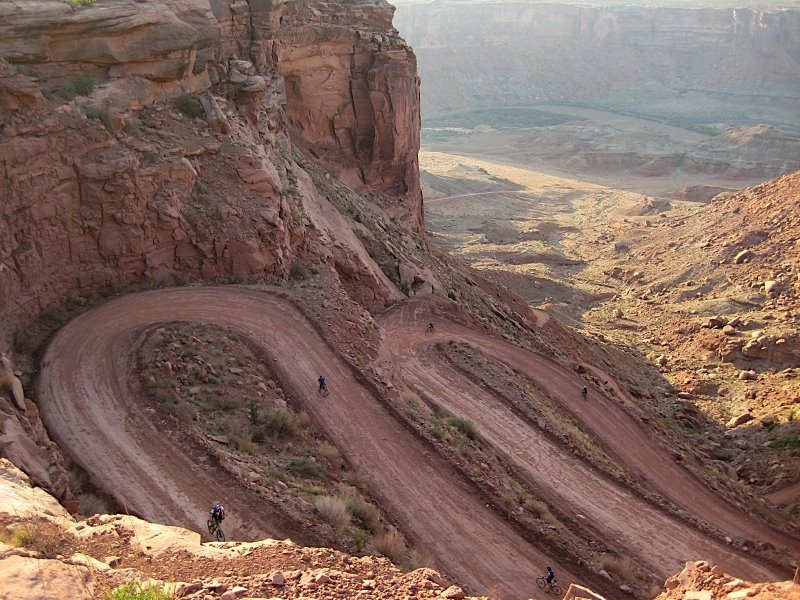 It’s a wonderful place to go riding. In fact, you might say I’m falling deeply in love with Corner Canyon. Last Thursday after work, I drove over to Corner Canyon and started my ride. Recently, I’ve been riding the Superfly — getting to know it — but this time I decided it was time to take out the Single Speed, especially since I plan to ride the SS at RAWROD this weekend. The SS felt so good. It had been so long since I had ridden the WaltWorks that I admit I was a little bit worried. Did I have the legs for the SS? Had I been spoiled by gears and a front suspension? Nope, not at all. It was like coming home. I swear, every time I ride that bike I want to give Walt a big hug. The sun was out and I had gotten the OK from Susan to spend some extra time on the trail, so I explored a little bit — checking to see where the trails were good, where they got muddy, and where they became snow-covered. After two hours, I was tired, muddy, and very happy. Time to go home. I linked up to a trail that would — I supposed — bring me back to the parking lot, but after paralleling the road for a while it veered off to the right, leading away from the road that would take me to the parking lot. As soon as I finished riding across the field and hopped the curb onto the pavement, I heard a weird sound: it sounded like I was riding on Rice Krispies. Or maybe on cornflakes. 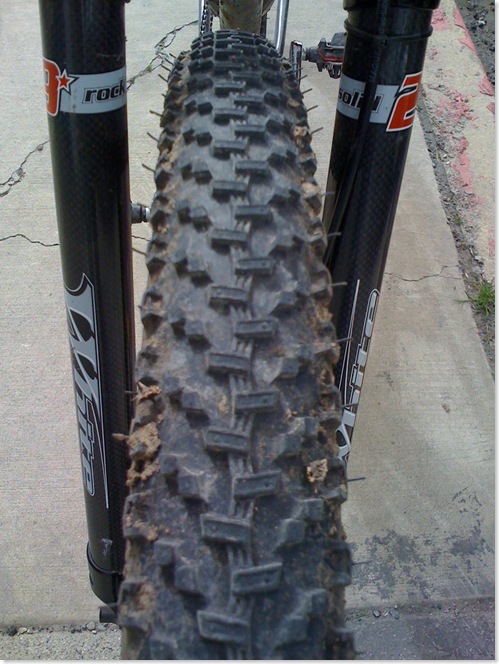 In reality, unfortunately, I was riding on a thick coating of goatheads — mountain biking’s answer to carpet tacks scattered on the road. You will have to believe me when I say that there were literally hundreds of these things stuck in my tires. I stopped, and started pulling the goatheads out. Each time I did, a little hiss of air and ooze of liquid latex would follow. After about ten minutes, I gave up. There was no way I would get all these out. So I took a picture of the ones that were left. See how many you can count in this section of one tire — be sure to count more than just the intact goatheads themselves; it’s the broken-off ones that are hard to find. So I took my bike into Racers, where he told me that, sure, if I wanted to spend the time pulling out all those thorns, the tire would probably hold air. In other words, since it would take me approximately four hours to find and remove all the hundreds (again, I would like to emphasize that “hundreds” is a literal, non-exaggerated number) of goatheads, during which I would not be working or riding my bike. Note: I know that some of you will want to quibble that the formula should be either C=4(W) or C=4(F), since I cannot be both working and playing at the same time. To you people (hi Big Mike), I reply that since when I am plucking thorns out of my tires I am neither working nor having fun, this odious task must be worth as much as the work and play value combined. I am not interested in dissenting opinions. Without wanting to brag, let’s just say that my math demonstrated that C = $3000.00. And that’s too much for tires. So I asked Racer to do it for me. Surprisingly, he declined, but offered to sell me a new pair of tires instead, and set them up for the Stans NoTube system at no extra charge. So, today after work, I’ll be picking up my WaltWorks, now with brand-spanking new Geax Saguaro 29s (highly recommended) mounted, and loaded with a fresh batch of Stan’s sealant. And I will never ever ever cut across that field again. I expect I’m not the only one who’s ever made what felt like a totally trivial decision, only to have it turn out to be stupid, embarrassing, and expensive. Oh, and painful, too. By all means, please leave a comment describing your expensive errors. What riding decision do you wish you could take back?